Arcing is the discharge of current that jumps a gap in a circuit or between two points. When the switching voltage and/or switching current of a reed switch is at the maximum specified limits, arcing happens and degrades the contact coating, thereby reducing life. For electricity following an unintended path, see short circuit. 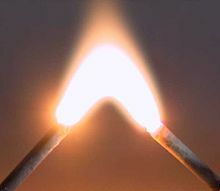 An electric arc, or arc discharge, is an electrical breakdown of a gas that produces a prolonged electrical discharge. The current through a normally nonconductive medium such as air produces a plasma; the plasma may produce visible light. An arc discharge is characterized by a lower voltage than a glow discharge and relies on thermionic emission of electrons from the electrodes supporting the arc. An archaic term is voltaic arc, as used in the phrase "voltaic arc lamp". Techniques for arc suppression can be used to reduce the duration or likelihood of arc formation. In the late 1800s, electric arc lighting was in wide use for public lighting. Some low-pressure electric arcs are used in many applications. For example, fluorescent tubes, mercury, sodium, and metal-halide lamps are used for lighting; xenon arc lamps have been used for movie projectors.